Photo 1 of 52, Sold! 1968 Camaro! 350/ Muncie 4 Spd! Sold! 1968 Camaro! 350/ Muncie 4 Spd! Sorry Sold! Slick little 1968 Camaro just in! 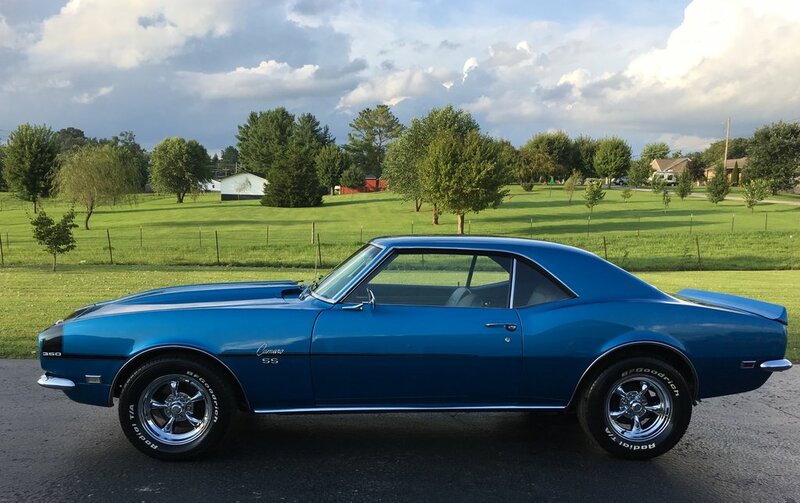 1968 Camaro, 350 Engine, Muncie 4 Spd Trans, 12 Bolt Rear, PDB, Cold Vintage A/C! NEW Blue exterior paint with Black Stripes! Nice Blue Bucket Seat Interior with 4 Spd Console! New Carpet, Front Seat Covers, Headliner, Door Panels! New Window Felts, New Fisher Sill Plates....all NEW Weatherstripping Kit! Camaro came out of GA, with no rust...has all original body panels with the exception of a NEW Cowl Hood! New Disc Brake Kit! New Dual Exhaust! New Front & Rear Bumpers, New Wheel, Drip Rail and Rocker Moldings! New Exterior Door Handles! Floors and Trunk are nice in this old car! New Torque Thrust Wheels with NEW BF Goodrich Tires! Little car is very nice for the money! Album by Herman's Classic Cars, LLC. Photos by C. Bowling. 1 - 52 of 52 Total. 52311 Visits.